The Dundas Medal has been awarded to the Specialist Palliative Care Team and Cardiothoracic Transplant Services at Newcastle's Freeman Hospital. L-R - Dr Maria McKenna, the new President of RCSEd, Professor Michael Griffin OBE and Professor Stephen Clark. News release – 10 November 2018 – A team specialising in palliative care for heart and lung transplant patients at Newcastle’s Freeman Hospital has won a national award. 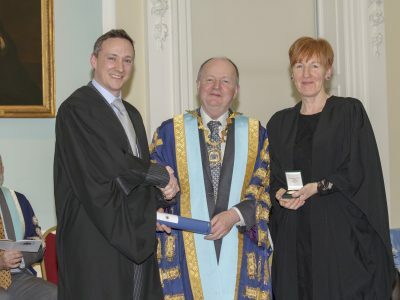 The Dundas Medal is awarded by The Royal College of Surgeons of Edinburgh and PATCH to reflect work done to improve the provision of palliative care for patients in hospital. 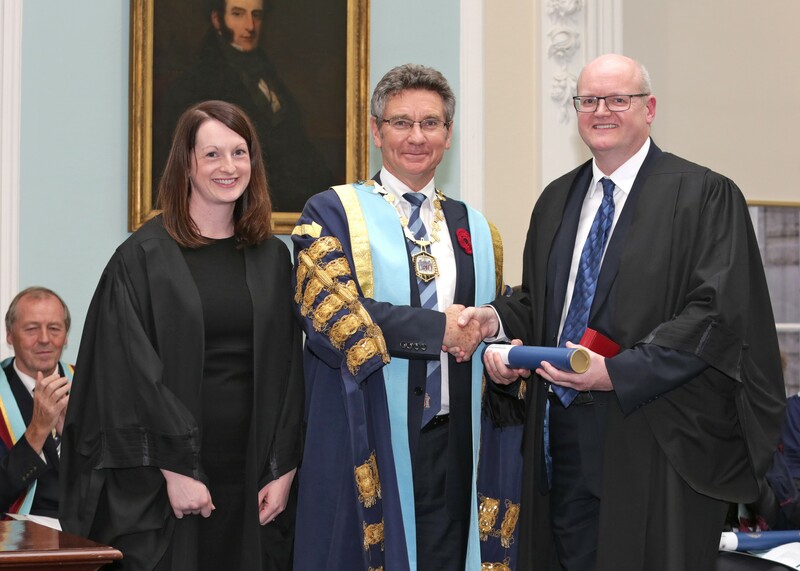 Dr Maria McKenna and Professor Stephen Clark, representing the Freeman Hospital team, were presented with the national award at The Royal College in Edinburgh by President Michael Lavelle-Jones during the College Diploma Ceremony on Friday 9 November. We are very proud to continue working with PATCH to award the Dundas Medal for the second year running and offer our congratulations to the deserving team specialising in palliative care for heart and lung transplant patients at Newcastle’s Freeman Hospital. As numbers on the UK heart or lung transplant waiting list reaches the highest point of the decade, there is a growing impact of the quality of care on offer to these patients. Being able to provide physical and emotional support to patients in palliative care is crucial towards generating a positive impact of the quality of life for these patients and their families. Whilst administering effective pain and symptom control might be at the forefront, good palliative care covers all areas of this support. It is a privilege to be able to provide respect, dignity and comfort to a patient and treat their palliative care on a case-to-case basis. This award honours the work the Hospital Specialist Palliative Care Team at Newcastle’s Freeman Hospital has achieved and we thank them for all the efforts made in this area. The Dundas medal was established in memory of Dr. Charles Robert (Bertie) Dundas, a consultant anaesthetist at the Aberdeen Royal Infirmary and a clinical senior lecturer at the University of Aberdeen for over 30 years. He died in 2014 from hepatobiliary cancer. His family provided the legacy for this medal to acknowledge the importance of good palliative care for patients approaching the end of life, particularly in a hospital setting. The need for appropriate holistic care including pain and symptom control, as well as clear communication with patients and families, is fundamental for those with life limiting conditions and especially at the end of life. The Dundas Medal aims to raise the profile of this need and entitlement across the UK. The work undertaken by the award-winning team at the Freeman is setting an example to surgical and palliative specialists all over the world. Cardiopulmonary transplantation is a life prolonging treatment appropriate for patients with end stage cardiac or respiratory failure. The example of palliative medicine and surgical consultants working together has the potential to greatly improve the outcomes for transplant patients. In 2016-17, 332 adults received a cardiopulmonary transplant in the United Kingdom including 165 heart and 167 lung transplants. However, the waiting list greatly exceeds the number of transplants that can be performed, due to the shortage of donor organs, and so many patients benefit from palliative care whilst waiting for a suitable donor or if their condition deteriorates. The number of adult patients on the UK heart or lung transplant waiting list in 2017 was the highest at any point this decade at 587. Around one third of those listed will die before a transplant can take place, as no suitable donor can be identified in time. Over the last year, 22 adult heart transplants, three heart and lung transplants and 43 adult lung transplants were undertaken at the Freeman Hospital. During this period, there were an additional 91 adults on the heart transplant waiting list and 133 adults remained on the lung transplant waiting list. Palliative care aims to maximise the quality of life of a patient with a life-threatening condition and their family, through careful symptom assessment and attention to holistic care. It is well established as a service, working alongside curative or disease modifying treatments, especially in the cancer setting. This award reflects the innovative work undertaken jointly by the Freeman Specialist Palliative Care and Cardiothoracic Transplant Services to improve the quality of care for this unique and complex group. We feel strongly that our collaborative approach to the improvement of palliative care for patients within the heart and lung transplant journey has already made a significant positive impact on a large number of patients and their families. Winning the Dundas Medal reflects incredibly well on our innovative end of life and cardiothoracic transplant surgical services. We are very proud of what we have achieved through our close partnership to benefit the patients waiting for heart or lung transplants in Newcastle. This is such an innovative approach to palliative care in a hospital setting. We are delighted to award the Dundas Medal to Dr McKenna and Professor Clark, whose work has the potential to change approaches to care while awaiting and following transplant surgery. Our best congratulations to the team, and we will continue to watch with extreme interest how this develops. 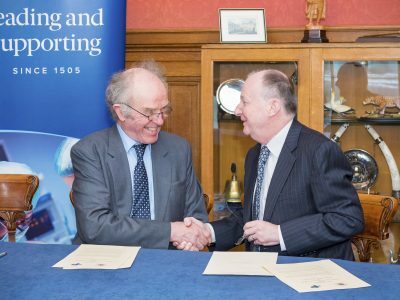 Scottish charity PATCH and Royal College of Surgeons of Edinburgh and collaborate to recognise those delivering best palliative care. PATCH (Palliation and the Caring Hospital) is the first charity specifically to support 24/7 specialist palliative care for patients in hospital.